Close Encounters with The Monkeys of The Sacred Forest | What an Amazing World! 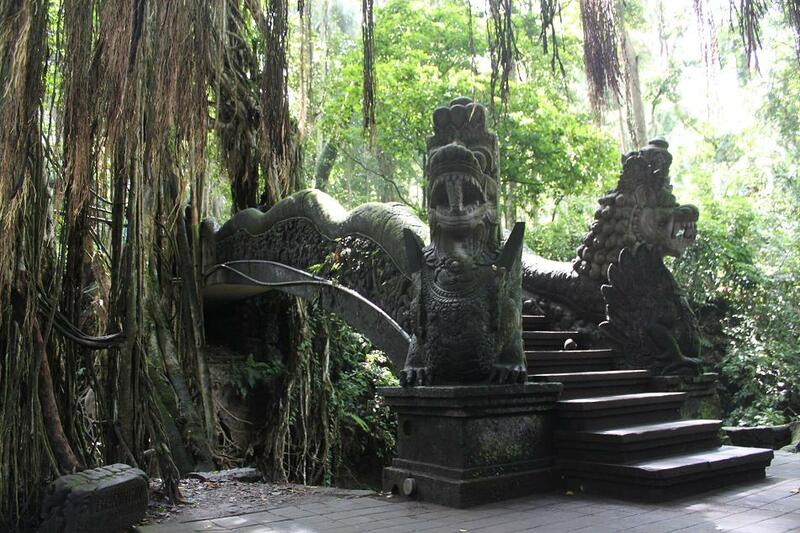 Hinduism in Bali is world-away from the one in India. 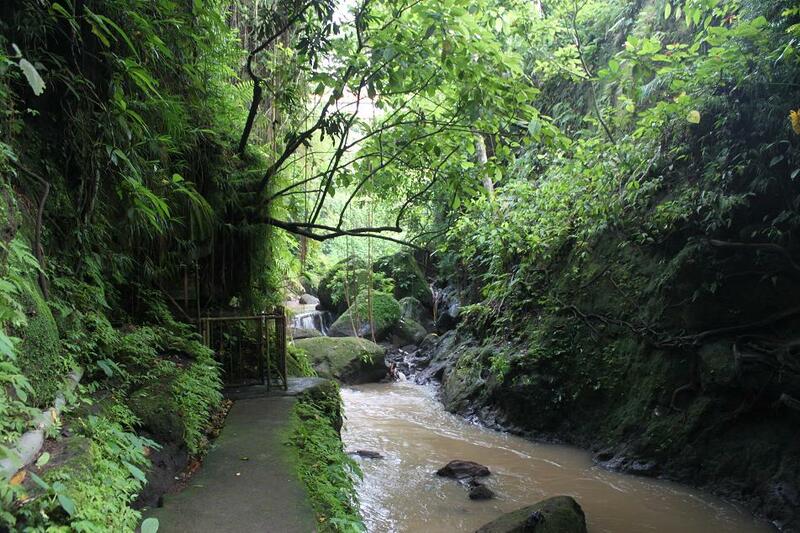 In Bali, the balance of the nature is one of the main principles in life. That explains why many Balinese traditions are heavily influenced with animism which emphasizes the respect to the nature and the creatures that dwell in it. 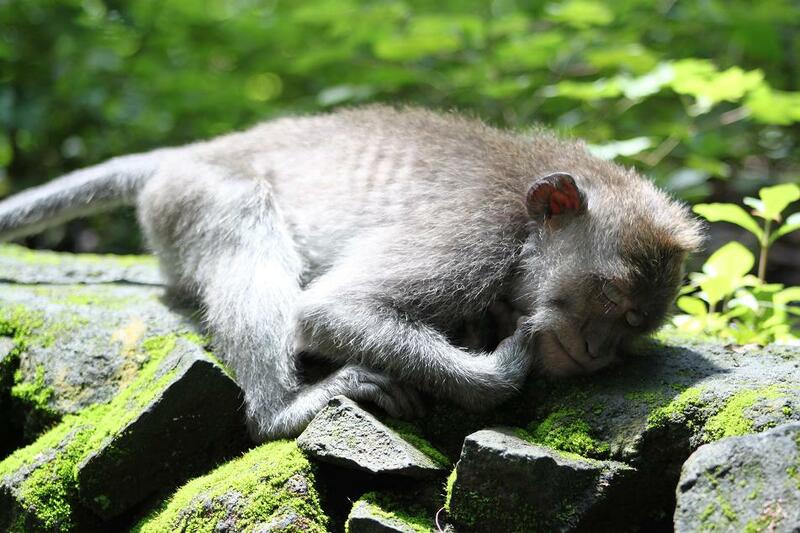 One of the creatures which enjoy a rather special treatment from Balinese people is the gray long-tailed macaques who live in almost every forest in Bali. The story of Ramayana also helps to keep their population healthy because it is said that when Ravana kidnapped Sita, monkey soldiers led by Hanuman fought against the king of Lanka to rescue Sita. 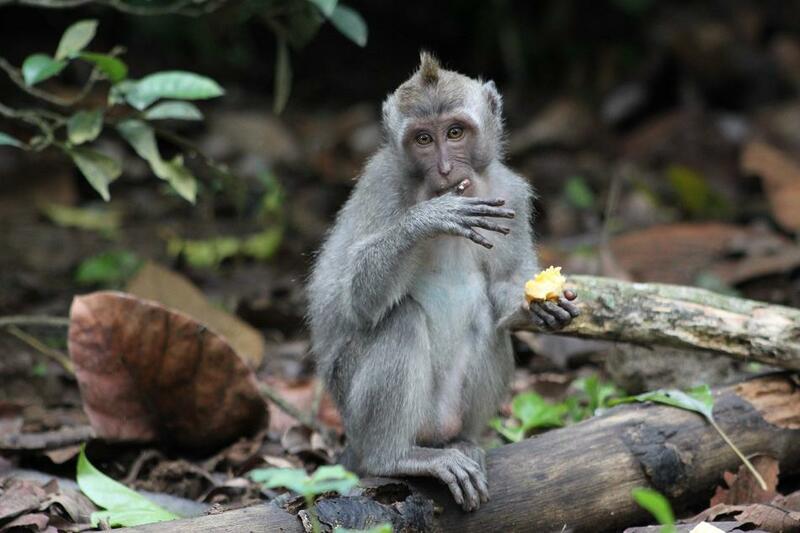 Heading to northeastern part of Bali, I made a stop at one of Bali’s most well-known sacred forests in Ubud where monkeys are well-fed and dwell freely. 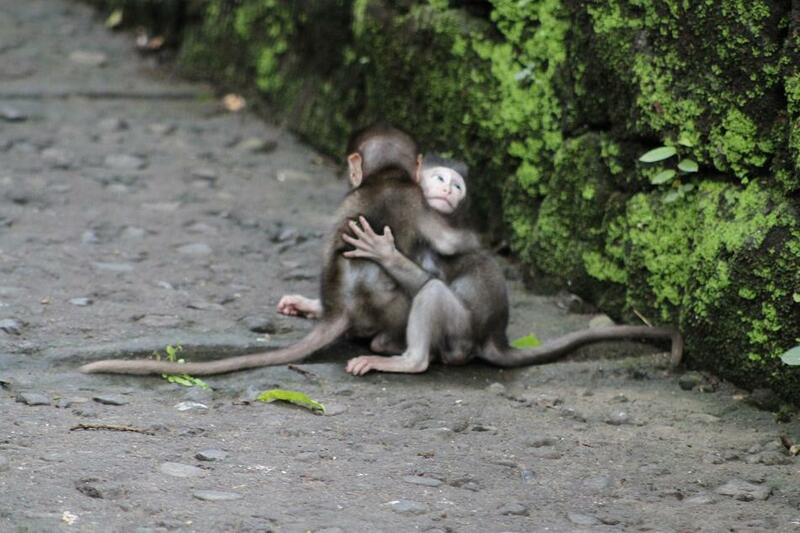 Unlike the ones in Uluwatu who often steal things from people, monkeys in Ubud behave much more nicely toward visitors. We can watch them very closely without having to worry that they might grab any of our belongings. Under the lush green canopy of the forest, they play around, show affection to each other, eat fruits and leaves, sleep and even fight while us, humans, watch them and giggle every time they do something funny. 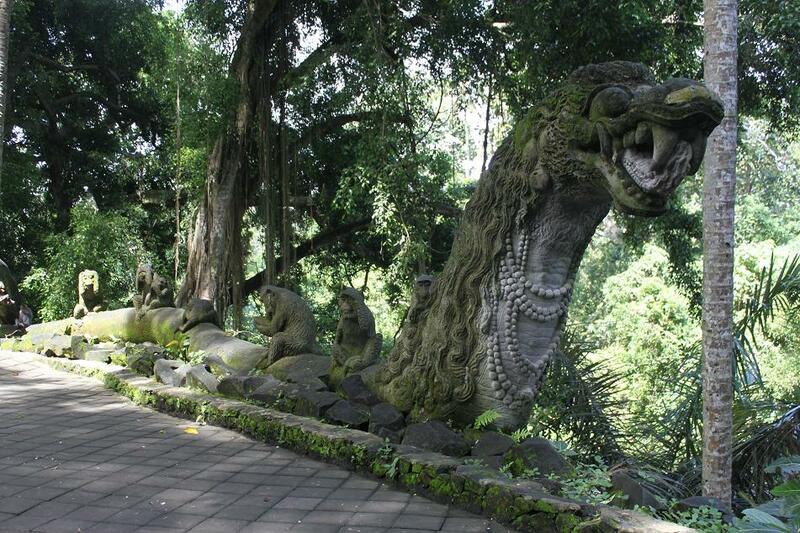 Like other places in Bali, there is of course a temple inside the forest. As expected, the temple is adorned with many monkey statues and also the statue of Hanuman. 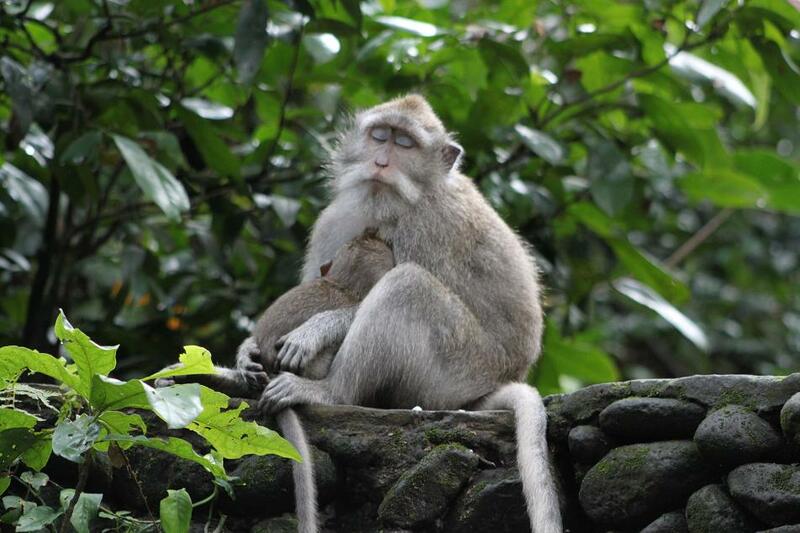 However, like most temples in Bali, the temple at the monkey forest is closed for the public because it is considered as a holy place where only Hindus can enter. 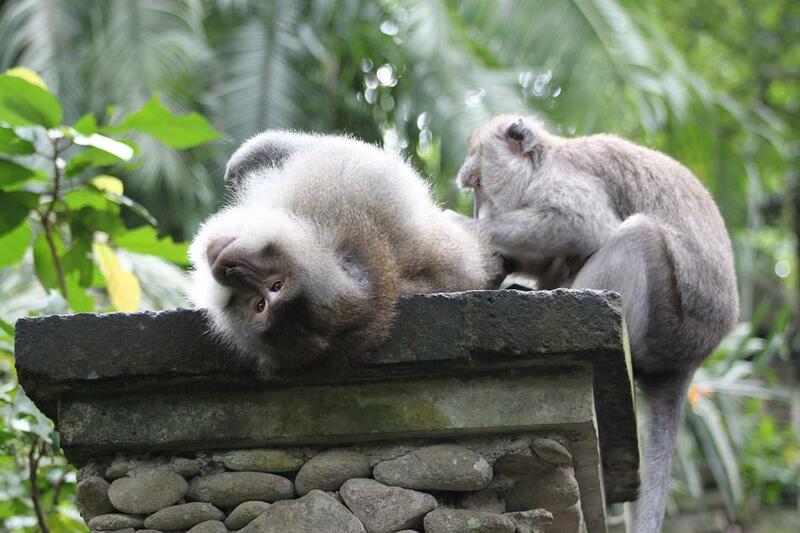 Nevertheless this place is worth a visit when you are in Bali, whether you are a monkey lover or not. One thing that we can learn from this place is that human can choose to live peacefully side by side with animals by respecting their needs. We are here on earth not to destroy what’s in it. But we are responsible to keep the planet a humane place for all creatures. This article also appeared in Bucket List Publications. Wow… I love the first photo! The monkey looks so wise, like an old soul! hehehe…. Do they get close to you? Very close!!! I can touch them if I want to. But I believe it is much wiser not to do that for that might be an annoyance for them. Those are really funny-looking-monkey-pictures that you took. BTW, did you use the 75-300mm lens? I mean, it’s going to be tricky if you want to take picture of those monkeys. What makes them funny for me is the fact that they behave pretty much like human, only with a long tail! Yes, I used that lens for some of my pictures. I wanted to stay far enough to let them just do whatever they wanted to do without having to get disturbed by my presence (which actually I believe they don’t). May I have your permission to repost “Close Encounters with the monkeys of the sacred forest,” with some, but not all, of the photos – on my blog http://sharonstjoan.wordpress.com/ ? Yes, of course! I’ll give you full credit and will send you the link! Thanks! 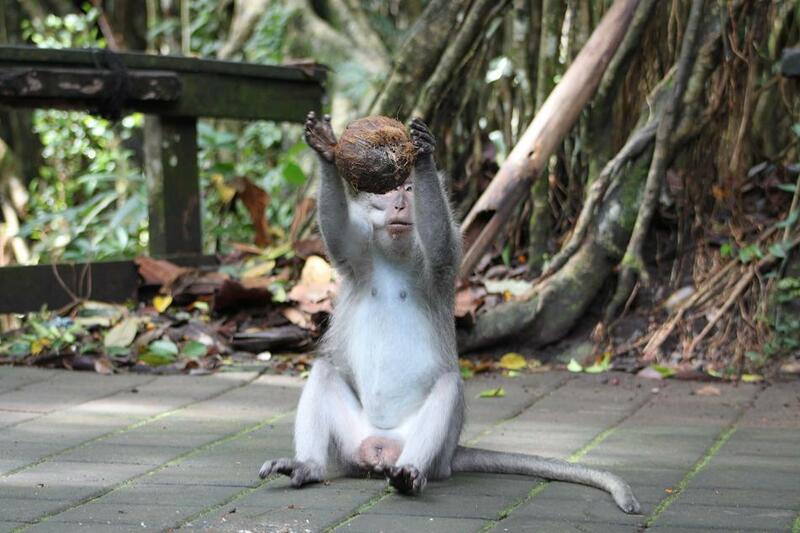 Oh yes, how I remember the Monkey Forest! Those monkeys could be very aggressive when people carried food around. You just had to be aware of them and respect them as you mentioned. Great pictures! Yes, they basically act according to their basic insticts, in this case: food for survival. Luckily, every morning all the traditional rangers always make sure that they are well-fed by providing abundant corns, coconuts, fruits and other foods. i love your sleeping monkey series, especially the first one! Thanks Fiona! Watching them behave in human-like activities did make me smile. Hey first time ever someone use my photograph as a desktop wallpaper! Thanks Fiona. Oh and happy new year too!!! really? oh, then im the lucky one, lol. thanks! Beautiful post! I would love to see the monkeys. What percentage of people are Hindus? Is the majority of people in Indonesia Muslim? I am definitely putting Indonesia on my list. I think you would need months to see it all! 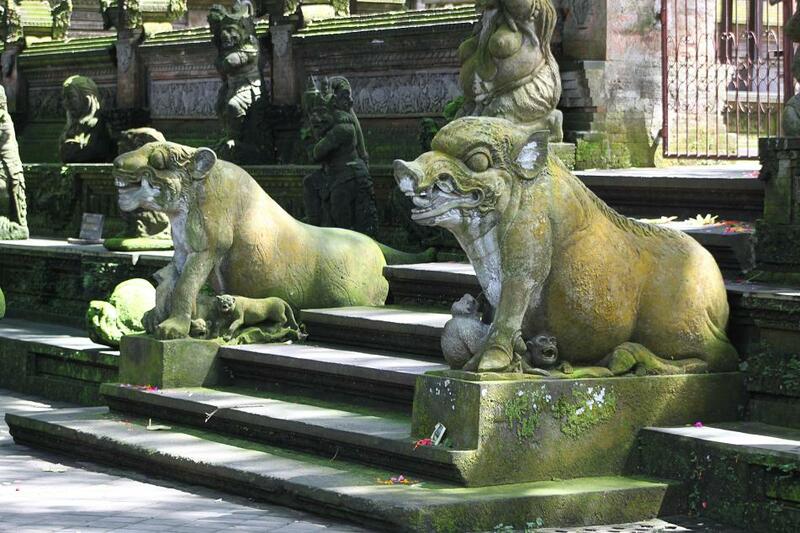 Approximately 92% of Balinese are Hindus, which only makes about 3% of Indonesian population. The country itself is predominantly Muslim (approximately 86% of Indonesians are Muslims). If you see on the map, Indonesia stretches about the same length as the U.S. east to west coast. So, you are right, it takes months to see it all! Please do let me know when one day you’re going to Indonesia. Thanks Sharon! I really appreciate it! These pics are pretty sick!